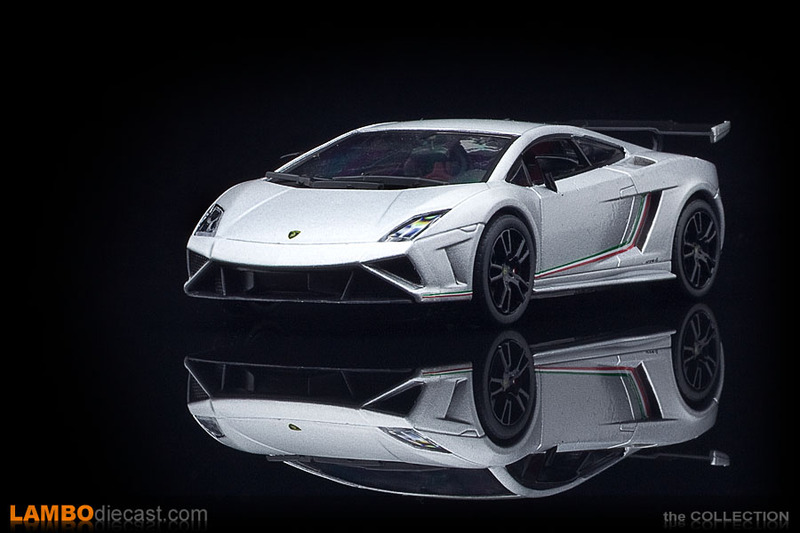 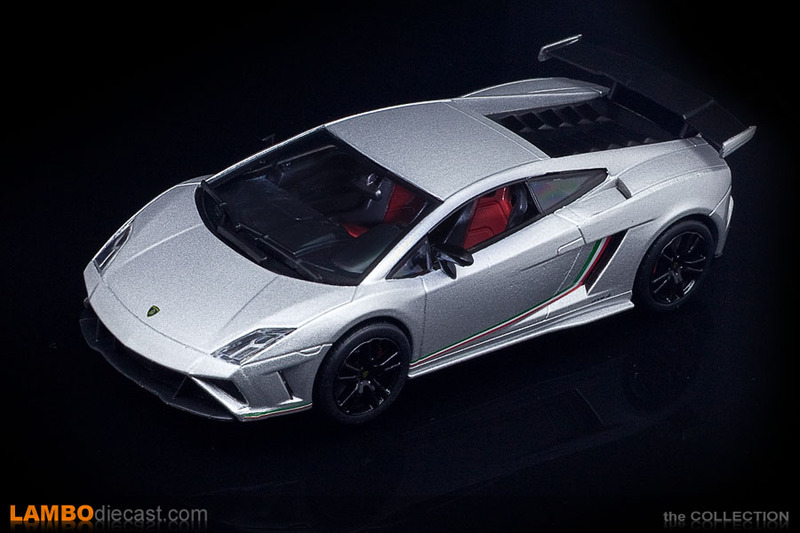 By 2013 the automotive world was waiting for Lamborghini to reveal the successor to the successful Gallardo model range, shown at the 2003 Geneva Motor show the V10 model was a decade old by now, and while it became the most sold Lamborghini model ever with 14,022 units, the replacement was long overdue by 2013. 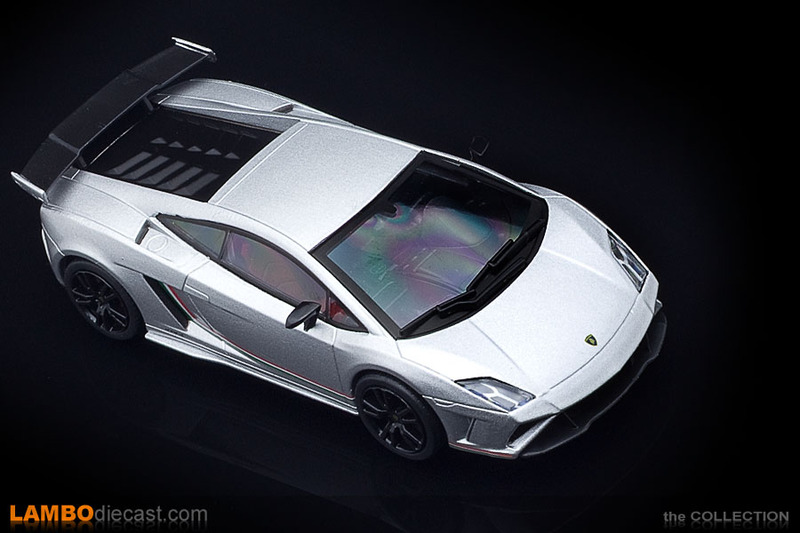 The story on the Gallardo Squadra Corse begins in late 2012 in fact, when Lamborghini unveiled the Nuova Gallardo at the Paris Motor Show, a restyling exercise on the Gallardo LP560-4 to prolong the production of this model until the successor was ready, this led to a new 2013 version of the Gallardo Super Trofeo race car and the Gallardo GT3 FL2 ... both using the triangular styling seen on the Nuova Gallardo. 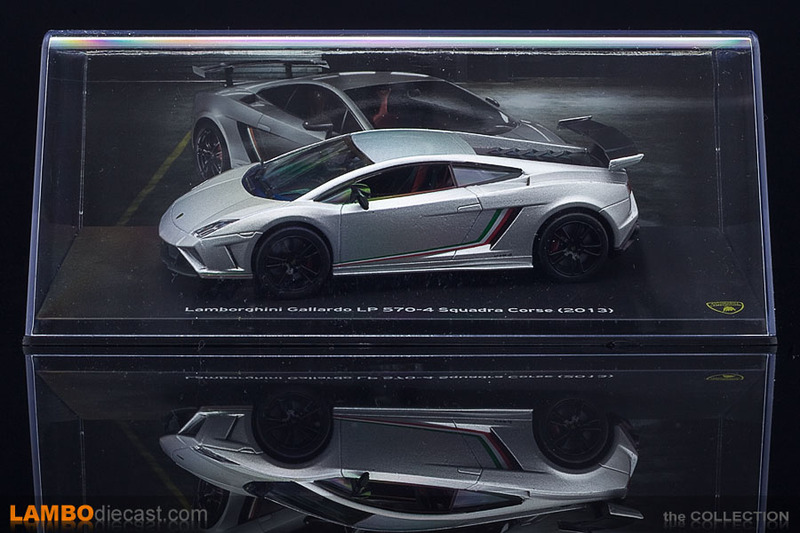 We all expected Automobili Lamborghini to unveil the V10 replacement at the 2013 IAA in Frankfurt ... but a few months before this show a different car was captured in spy shots around the factory ... turned out Lamborghini was working on a final swansong for the Gallardo ... in the form of the LP570-4 Squadra Corse. 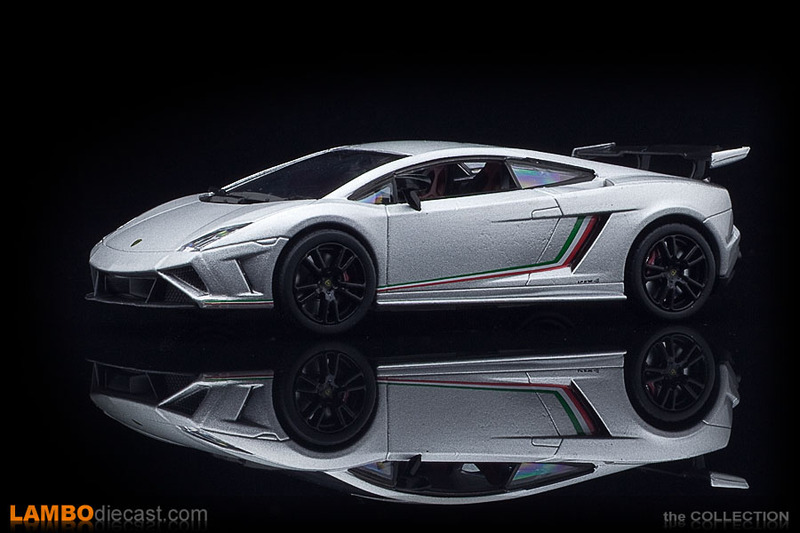 The best way to describe the Gallardo LP570-4 Squadra Corse is an evolution of the Gallardo Super Trofeo Stradale from 2011, but with the Nuova Gallardo styling added to it, this final model was a tribute to the new Lamborghini Squadra Corse department that would handle all racing related models from then on. 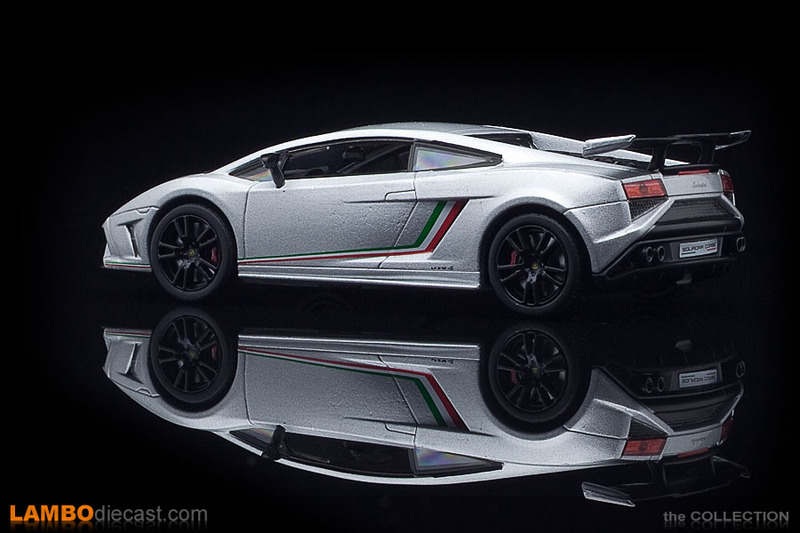 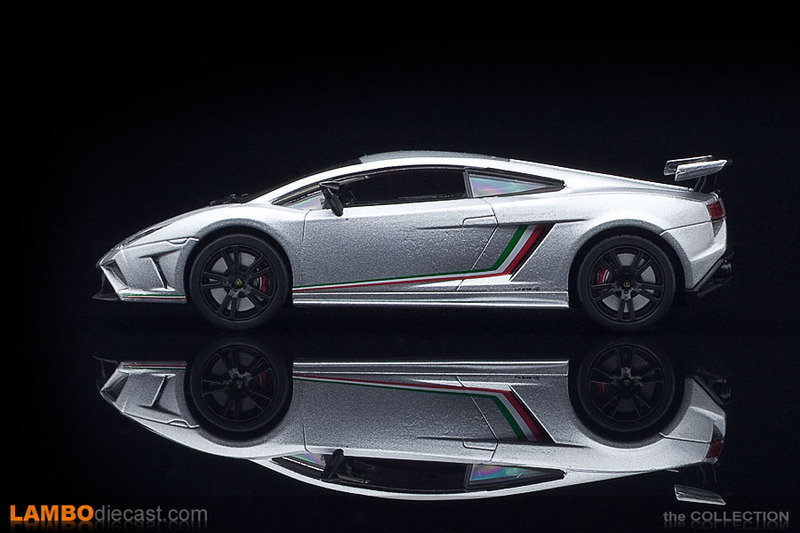 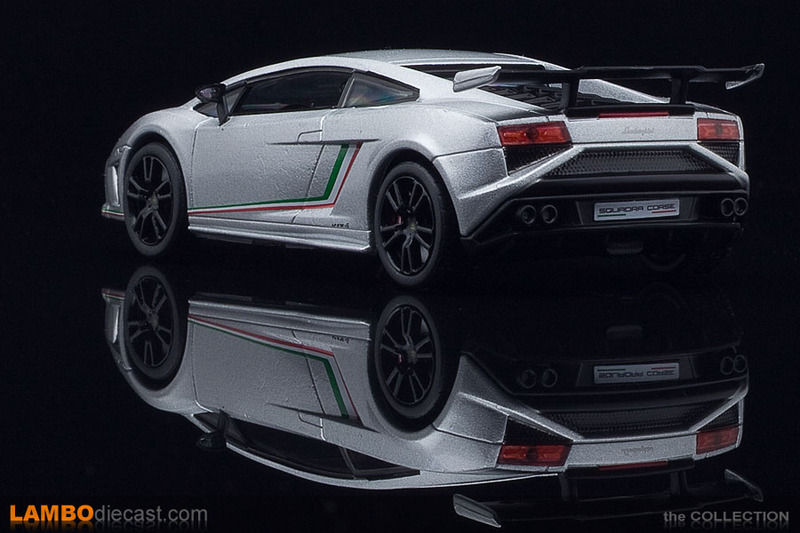 I know there is a much better Looksmart model for the Lamborghini Gallardo LP570-4 Squadra Corse available, but as you know I'm not really a 1/43 scale collector, I prefer the larger 1/18 scale models, but that is no 1/18 scale model available for this specific Lamborghini, so when I found this smaller one for only €20 I couldn't resist adding her to the collection. 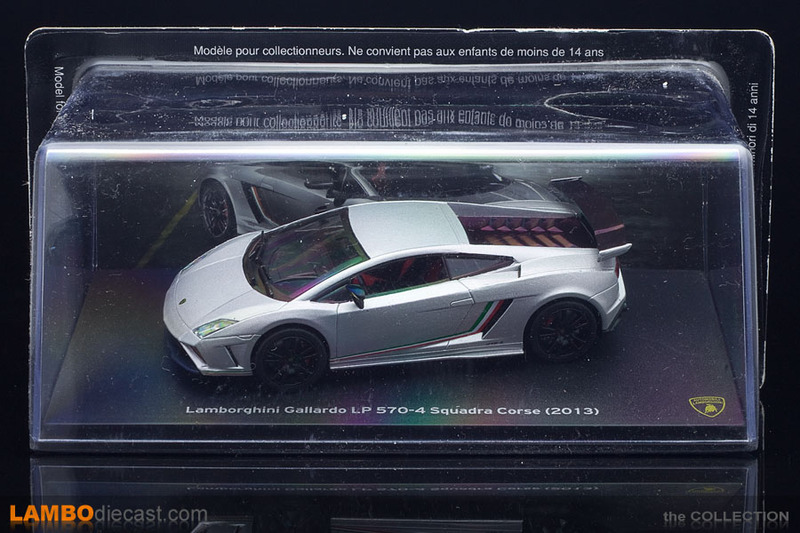 I've been told this model is made by Ixo, but neither the packaging nor the bottom of the model itself mention any name of the manufacturer, but it could very well be made by Ixo, the packaging and plinth do look the part, this model is part of a publication that releases a new model on a regular basis and comes with a nice, multi-page booklet together with this model on a cardboard package. 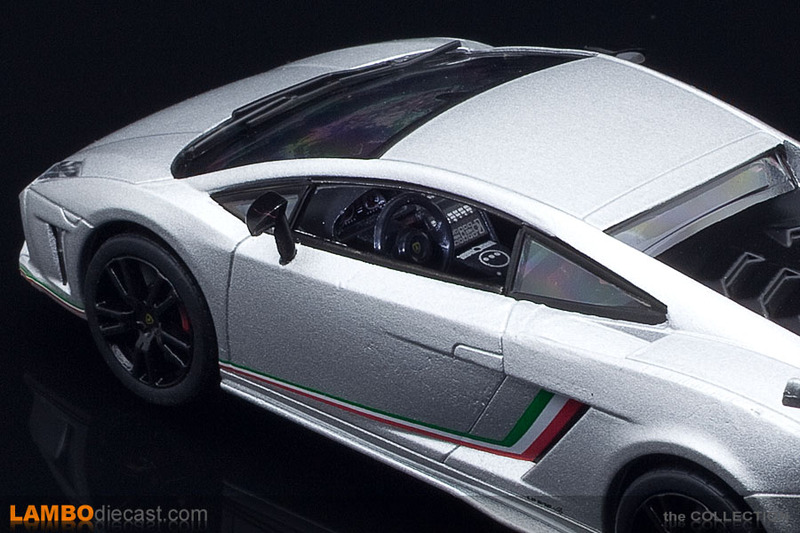 This surely isn't the most detailed 1/43 scale model on the Lamborghini Gallardo LP570-4 Squadra Corse, but I rather like it, the model comes with disk brakes and correct red calipers, also the interior is visible, complete with the two-tone red and black upholstery ... very nice for a €20 model if you ask me.